Posted on March 25, 2014 by Jen C.
It makes use of a yard space that would otherwise be fairly useless, unless you love admiring plain grass (we don’t). Although the first year of purchasing tomato cages, etc. can be pricey, after that, you’re saving tons of money on fresh produce. You know exactly where your food comes from and how it was grown. You appreciate it so much more, too, knowing the hard work that went into growing and harvesting it. You’re far less likely to let it go bad because of that. Gardening is a heritage thing. Without it, many pioneering families wouldn’t have had food to eat. Our rural-ish roots call to us to keep the tradition alive. It’s great for kids, too. We don’t have any right now, but when we do, you can bet they’ll be helping us garden because it helps teach responsibility, not only for caring for plants, but also a responsibility to care for the environment. Plus, it teaches children that food doesn’t just magically appear in the grocery store. Until this year, the Mister and I didn’t have a space appropriate for a real garden. In Nebraska, we’d attempted window boxes of cherry tomatoes and lettuce, and found the tomato plants just never produced, and the lettuce ended up being caterpillar food before it was even time to harvest it. That was a sad, sad discovery, although those really fat, happy caterpillars were pretty cute. I wish I had pictures. So bittersweet! We were lucky enough to get a plot in a community garden this year. It’s about 10-feet by 10-feet, with extra space for some paths throughout the plot. 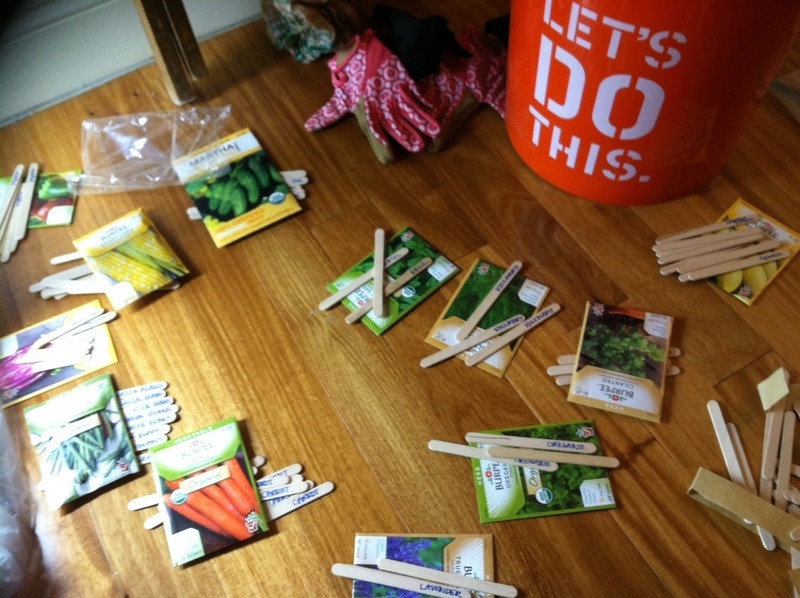 Because we’re amateurs, the Mister took a “Super Small Space Veggie Gardening” class from The New York Botanical Garden so we wouldn’t look quite as ridiculous among the master gardeners. After meeting a few of the gardeners in person when we visited our plot, we realized we’re still going to look ridiculous, but we’re also going to learn tons from them. 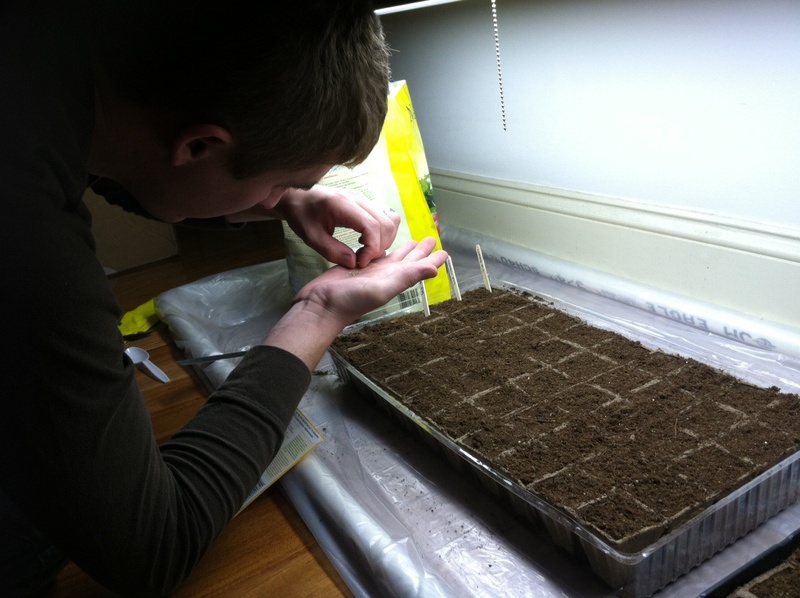 And, we started our seeds in a makeshift indoor green house with a grow light, currently taking up roughly eight square feet of space in our living room.The Mister made the framework for it from 3/4″ PVC pipe and an inexpensive fluorescent shop light. He’s pretty handy and good at manipulating tiny seeds (thanks to years of work on ridiculously intricate architectural models). …while I organize and label. LET’S DO THIS! We have about 115 plants to work with, including a variety of organic vegetables, flowers and herbs. We know some won’t germinate, and some won’t thrive in the garden, so that’s why we’ve planted extras. One of my favorite parts was examining the differences in the seeds. The Mister was particularly impressed with the marigold seeds, which I was familiar with from my first gardening experience with my mom when I was around seven. We’re hoping some marigolds throughout the space will help keep away bugs and bunnies! We’re in USDA zone 6, so we have plenty of time before we have to go put any of these babies in the ground. 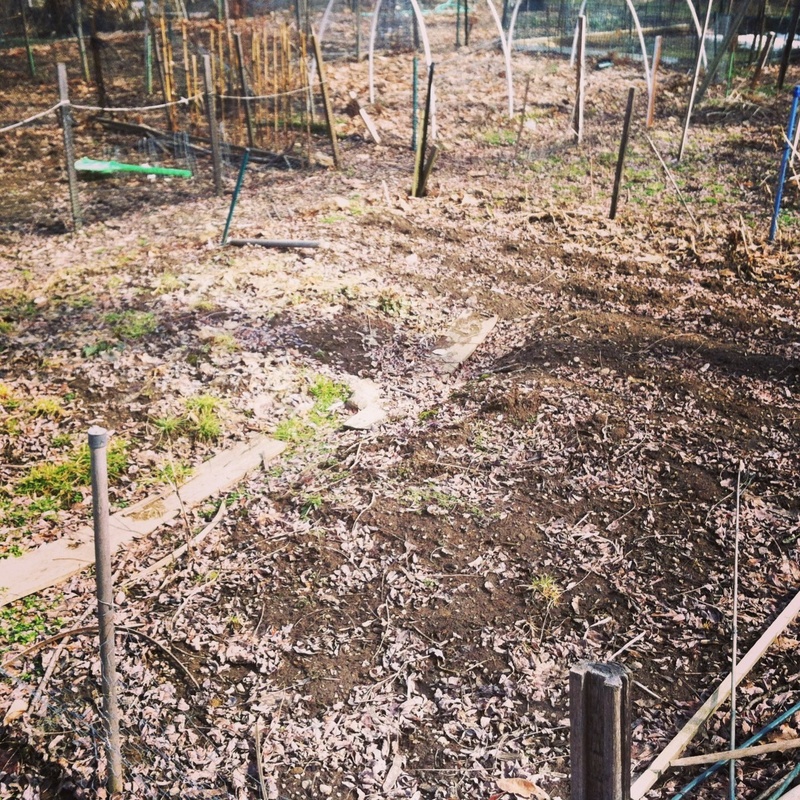 In the meantime, check out our garden plot (before we turned the soil — a lot of clay! — and added some compost).